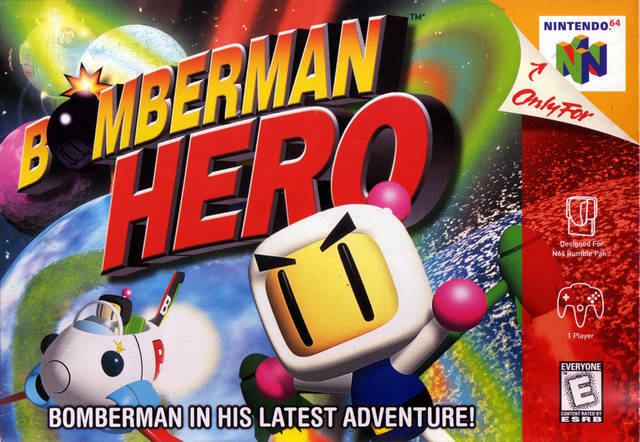 Bomberman Hero for Nintendo 64 features one-player missions that have taken the place of the multiplayer functionality. The controls allow the player to increase the number of bombs thrown at one time (from one to four) as well as alter the diameter of the blast radius. Power-ups also make available such fun accessories as the Freeze Bomb, Salt Bomb, and Remote Control Bombs, as well as the ever-popular Power Glove. The action takes place over five distinctive worlds.